I know my last post was a Boots gift guide for woman but it went down so well that I thought i'd get straight onto it and do a For Men Post in time for all those eager shoppers. You can't go wrong with an alarm clock for the man in your life and I love how different this one is. This is perfect for movie fans too and because of the black colour, it won't look out of place in most bedrooms. At £18, this is a real bargain! This is amazing! Perfect for those fun loving, outdoorsy types. At £74 this would definitely be a main present but I think it's such a fun, lovely idea. 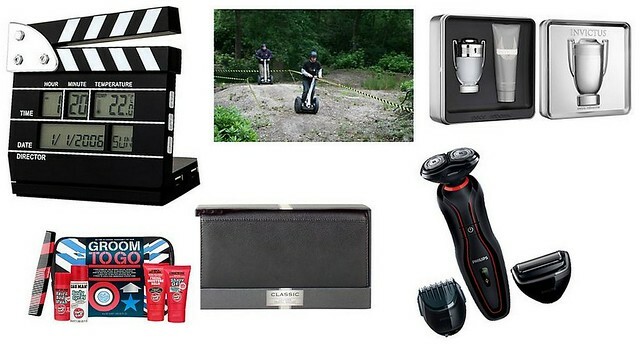 You could always make this into a weekend away to so you kind of get a present as well ha! Aftershave is also a fail safe present idea and at Christmas time there's always some brilliant gift sets. I chose invictus as I know my boyfriend wants it but there are lots of different ones on the Boots website for around £39. I also really like the gift box as it's great for storage, my boyfriend uses his to keep his watches in. Just like in my womens gift guide, Soap and Glory is a firm Christmas favourite. This is the first year that i've seen a range for men and i'm really intrigued. My boyfriend is forever stealing my shower gel so this is perfect for him. It's also a bargain at £16 as it contains 5 products. There are also lots of different sets so you can find the perfect one for whoever you are buying for. A leather wallet is the perfect accessory for any man. They use them everyday and can last for so long. I like how classic this one is, so it's perfect for dads or work colleges. If you have younger brothers or friends then you can find a great range of wallets at River Island which are a bit more young and fun. Again, another classic gift. But I really don't think you can go wrong with something useful. Most men forget about buying these important things so it's really nice for them to have something they need. This is another gift that is more on the expensive side at £74.99 but definitely worth it. I hope this helps some of you, i'm also thinking of doing a gift guide for men that isn't focused on Boots if you would like to see that?